The immense riches of the Esoteric Iconography of Japanese Buddhism are illustrated in this volume in all its fullness and clarity of detail. It is an indispensable work for the understanding and appreciation of Indo-Asian Art of Japan as represented by mandalas. 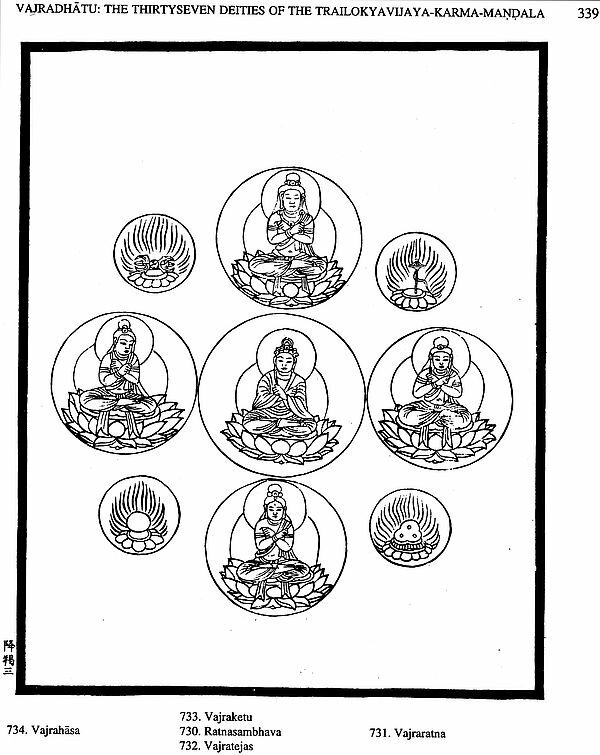 The mandalas or psycho-cosmograms reached Japan through great Indian teachers like Vajrabodhi, Amoghavajra and Subhakara-simha. The Japanese Twin Mandalas represent innate Reason and primal Enlightenment, harmonizing in Compassion and Dynamis. Herein the sadhaka identifies himself with the forces that govern the universe, and collects their thaumaturgical powers within himself. The Light that burns within spreads out and is diffused, guiding towards noble paths. 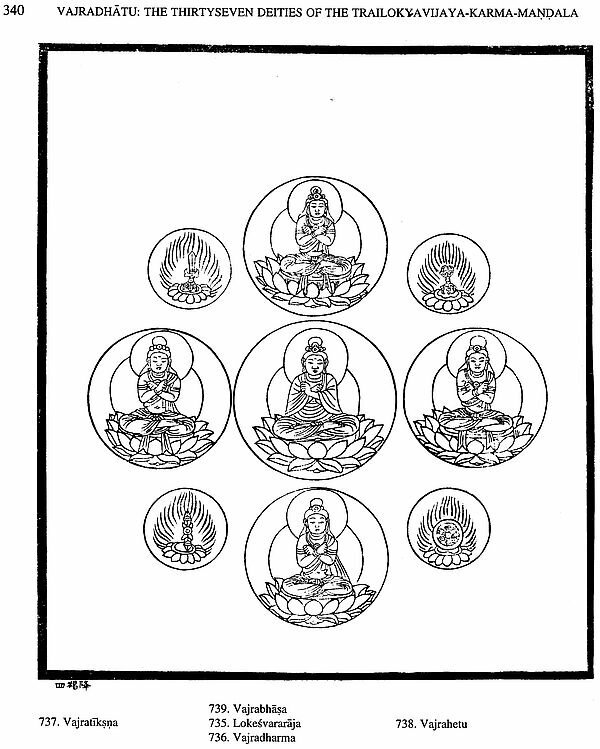 As pointed out above, the iconography pertains to the Twin Mandalas of the Mahakaruna-garbha-mandala and the Vajradhatu-mandala, which were taken to Japan by Kobo Daishi (774-835) from China, where he had gone in search of the Transcendental Path of Mantrayana. 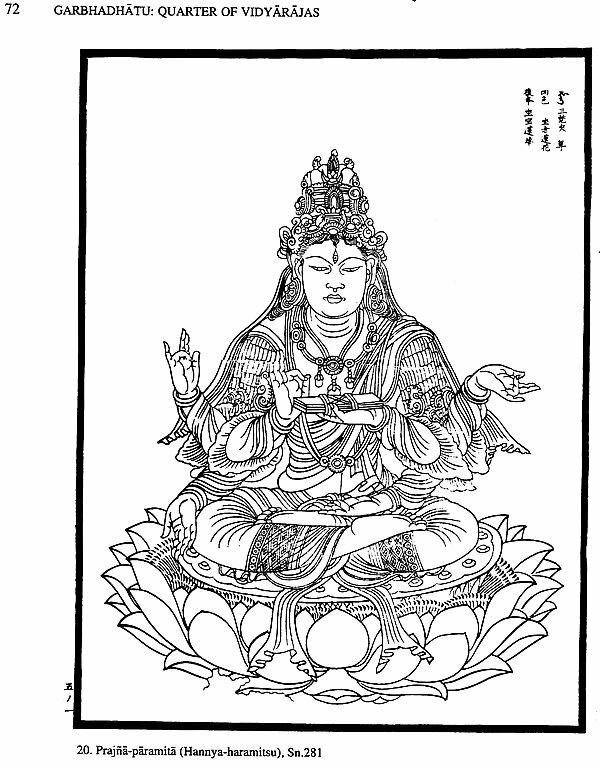 Kobo Daishi inherited the Tantric tradition of Amoghavajra (705-774) "the Master of Eloquence and Wide Wisdom", whose genius was responsible for the translation of the Vajradhatu texts on the contemplative system of Esoteric Yoga, which was visualized in the iconics of the present mandalas. 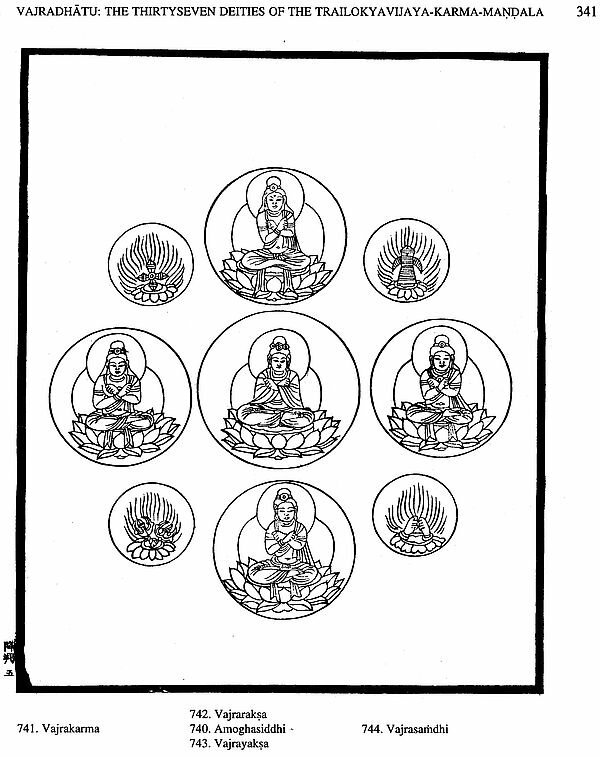 Kobo Daishi was initiated by of Amoghavajra. In 806 Kobo Daishi returned to Japan, with profound Gods born unto him, with homa consuming baser passions, his total being illumined by a new vision. 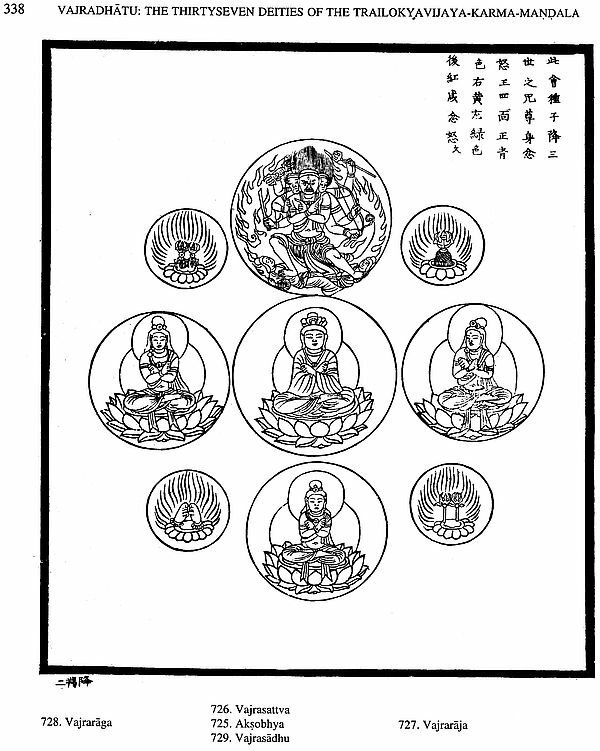 While Kobo Daishi carried the sutras expounding the Vajradhatu, he also took along with him its PICTORIAL representation in the form of two mandalas. 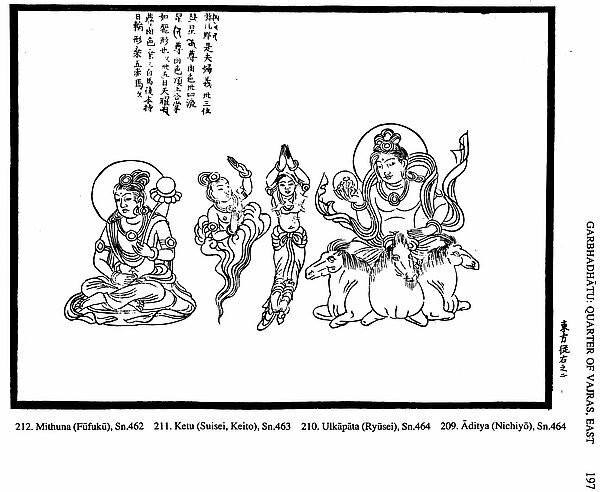 Hui-kuo had them drawn, for the sake of Kobo Daishi in accordance with the Tattva-samgraha, by the famous painter Li-chen assisted by more than ten other artists. These Twin Mandalas found their efflorescence and fruition in Japan. The mandalas brought by Kobo Daishi are now lost, but from them were painted the Takao Mandalas in AD 824 in gold and silver lines on purple damask silk in polychrome. 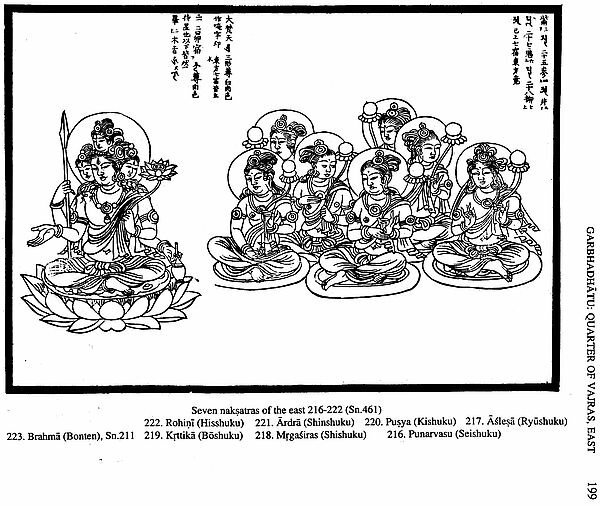 The present woodcut version goes back to the Takao Twin Mandalas through Ken-I's monochrome copy drawn in AD 1035 on the 200th anniversary of the nirvana of Kobo Daishi. 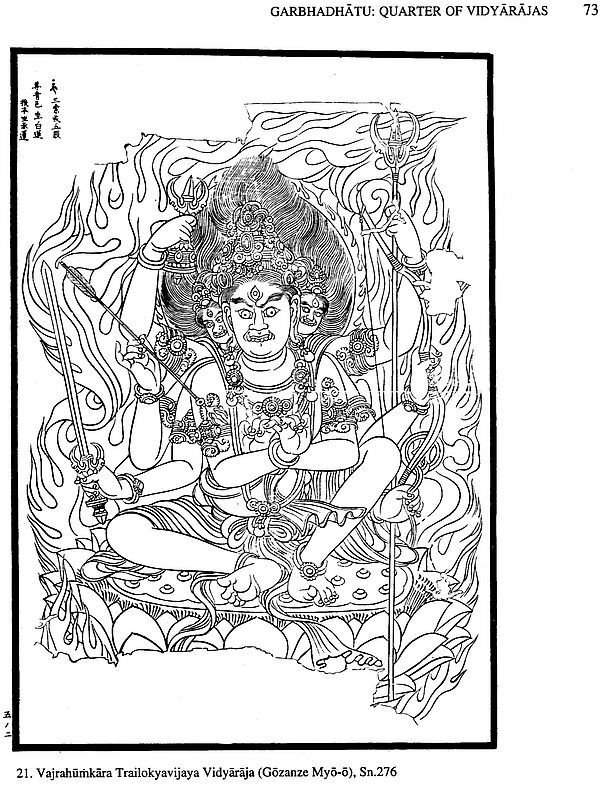 It is monumental work on Tantric Iconography in general, and on its Japanese idiom in particular, wherein the original woodcuts are reproduced. 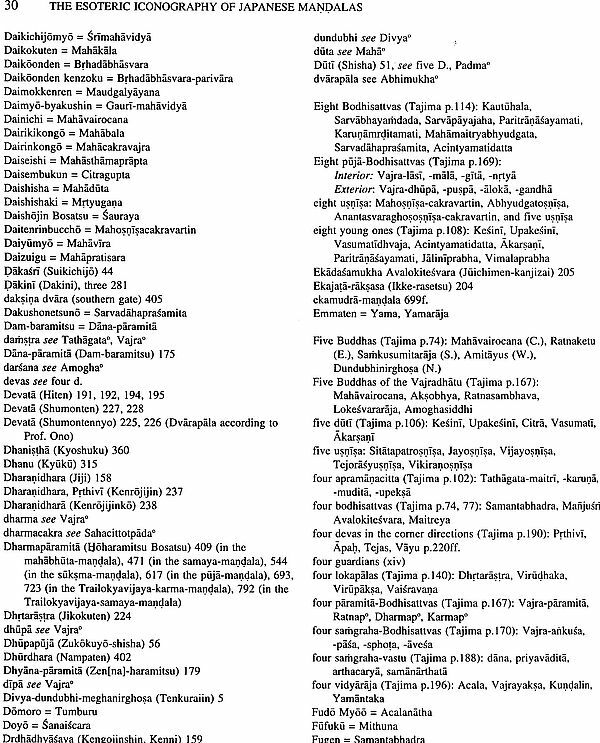 There are 861 illustrations, each identified by its serial number, Sanskrit name, and Japanese designation in romanisation. These manifestations of the Unmanifested free consciousness from of veil of maya to give way to the luminosity of Consciousness, pure and beyond form. Prof. Lokesh Chandra is a renowned scholar of Tibetan, Mongolian and Sino-Japanese Buddhism. He has to his credit over 400 works and text editions. Among them are classics like his Tibetan-Sanskrit Dictionary, Materials for a History of Tibetan Literature, Buddhist Iconography of Tibet, and the ongoing Dictionary of Buddhist Iconography. Prof. Lokesh Chandra was nominated by the President of the Republic of India to the Parliament in 1974-80 and again in 1980-86. He has been a vice-President of the Indian Council for Cultural Relations, and Chairman of the Indian Council of Historical Research. Presently he is Director, International Academy of Indian Culture. On the afternoon of 18 September 1970 I left historic Horyuji for the Kokiji monastery, perched atop a hill, surrounded by forests of primaeval charm, with clouds hovering over the pines - all picturesque in the profound simplicity of a Zen scroll; a hermitage of silence and meditation amidst the poesy of the Lord that never dies nor decays. According to its mahatmya or legendary history this monastery is a sacred site where the Japanese god Nigihayahi-no-mikoto descended from heaven. Situated in Hiraishi, Kanan-cho, Minami-gun, in the Prefecture of Osaka, it is one of the 28 sacred places among the mountains of Katsuragi funded by the ascetic of Yen, during the reign of Emperor Mommu Ozunu, after the 28 chapter of the Saddharma-pundarika-sutra. This monastery is the 25th sacred site. 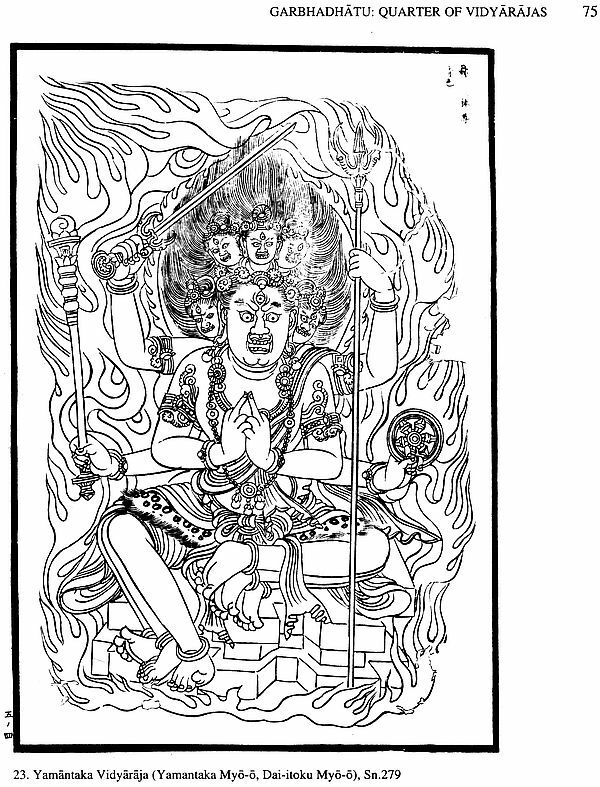 During the era of Konin (810-824) in the reign of Emperor Saga, Kobo daishi established the golden temple, lecture hall, eastern and western pagodas, repository of sutras, bell pavilion, dining hall and the gateway with Vajrapani's Tradition has it that he himself carved the statues of the Five Great Vidyaraja. He is also credited to have carved a statue of Sarasvati Devi and enshrined it in the lecture hall. Kobo daishi dedicated a bell brought from China. He also paid visits to the mausoleum of Prince Shotoku for a hundred days. The Abbot of the Toji monastery, Venerable Hanshun stayed at this monastery during the Chochi era (1104-1106) in the reign of Emperor Horikawa. Emperor Go-Toba visited the monastery on 13 March of the sixth year of Kenkyu (1190-1199). The royal envoy Norisuye and the deputy envoy Fujiwara-no-jushi erected a 13-storied stone pagoda in June of the 8th year of Kenkyu (1198). Ex-emperor Go-Uda visited the monastery in the second year of Showa. Emperor Go-Daigo visited the Hiraiwa castle near the monastery on his way to Kusunoki-masashige in the first year of Genko (1331). The enemy general attacked the monastery and put it to fire. In the following year (1332), the first year of Shokei, devoted adherents reconstructed the buildings of the monastery. The fortunes of the monastery are skipped over in the historic sketch for the succeeding four centuries. It came to the fore with the appointment of Ven. Ji-un as its Abbot on 27th May of the sixth year of Temmei (1986). It became the central monastery of the Shingon ritsu sect with a dormitory, famous for the observance of Vinaya regulations. 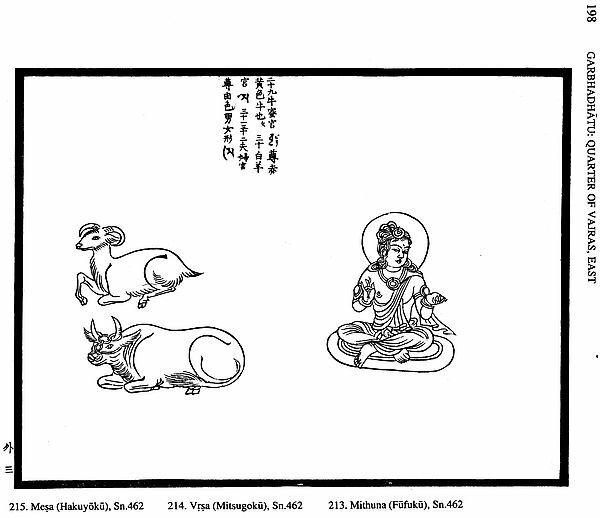 The bhiksus studied the Shingon, Tendai, Zen and Jodo sects. Henceforward, it was the centre of sila, upavasatha and abhiseka, and above all of Sanskrit studies, due to the untiring efforts of Ven. 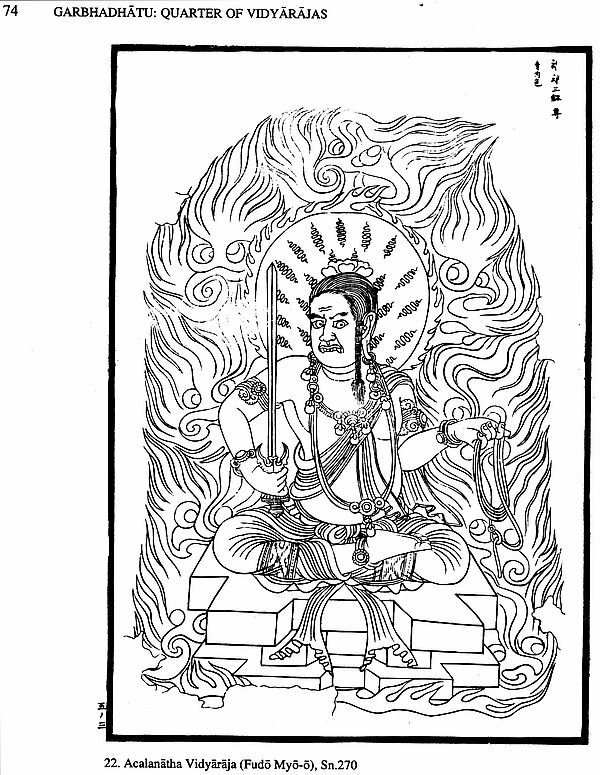 Ji-un who rendered his name into Sanskrit as Maitri (ji)-megha (un). His alias Onko ('drinking the light') was appropriate to him, a distinguished personality of the late Tokugawa period, gentle and kind by temperament, and well-versed not only in Buddhist learning but also in Chinese classics and Japanese Shintoism. He was respected and adored by members of the Imperial Household, for example by Kyoreimonin the mother of Emperor Go-Momozono. Some of them received the dasa-sila from him. The feudal lord of Yamato province, Yasumitsu was his devotee. He attained nirvana in December of the first year of Bunkwa (1904), at the ripe age of 87. The monastery had difficult times in the early Meiji period, because of the policy of the Japanese government of disown Buddhism and promote Shintoism. In the 7th year of Meiji (1874) Ven. Kaishin became the Abbot of the monastery and contributed to its restoration, though he had difficulties in maintaining the monastic estates of forests. In the 13th year of Meiji (1880) he visited Tokyo and gave about 90 Sanskrit manuscripts collected by Ven. Jiun to the clerk of the British Legation Mr. Ernest Satow in exchange for a set of the Veda published in England. 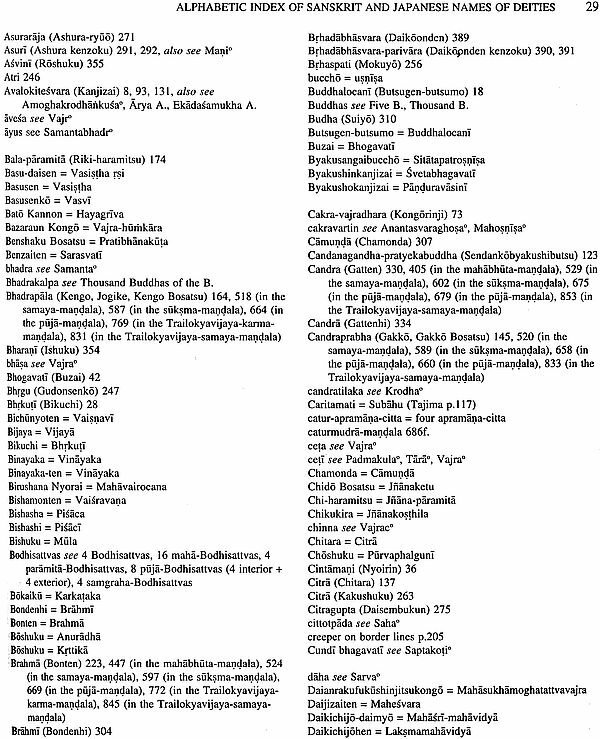 A copy of the Rgveda reached the monastery on 21 December 1880 (13th year of Meiji). The Sanskrit manuscripts given to Mr. Satow were published by Max Muller. The fame of Ven. 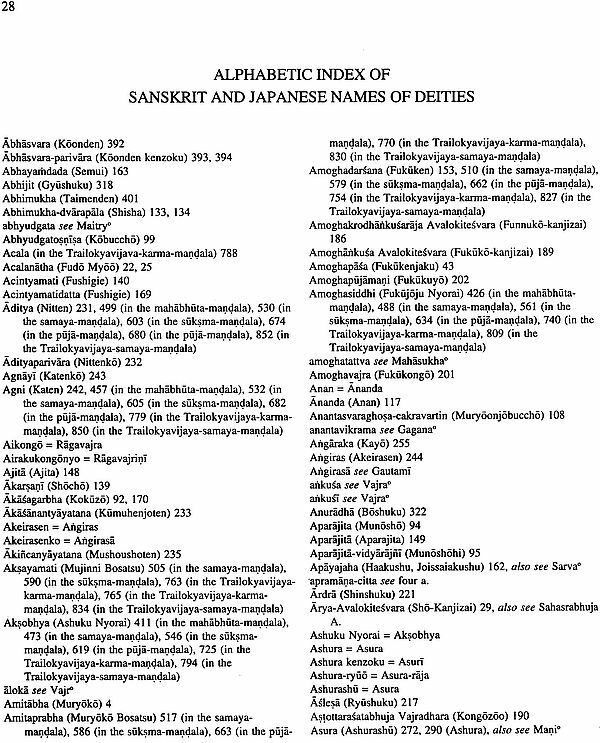 Jiun the outstanding Sanskritist of Japan and of the Kokiji monastery spread in Europe. In July of the 30th year of Meiji (1897), Sylvain Levi the eminent French Indologist, visited the monastery and stayed for three days to explore the history of Sanskrit studies. 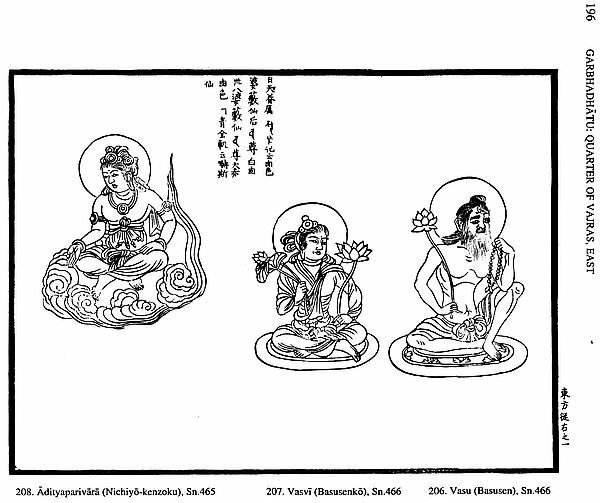 The publication of the works of Ven. Jiun was undertaken by Ven. Kaishin who brought out his Shinju-gudan 'Account of Shintoism and Confucianism' in the 44th year of Meiji (1911). The complete works of Ven. Jiun were published from 13 Nov. 1921 (9th year of Taisho) upto late September of 1926 (15th year of Taisho). 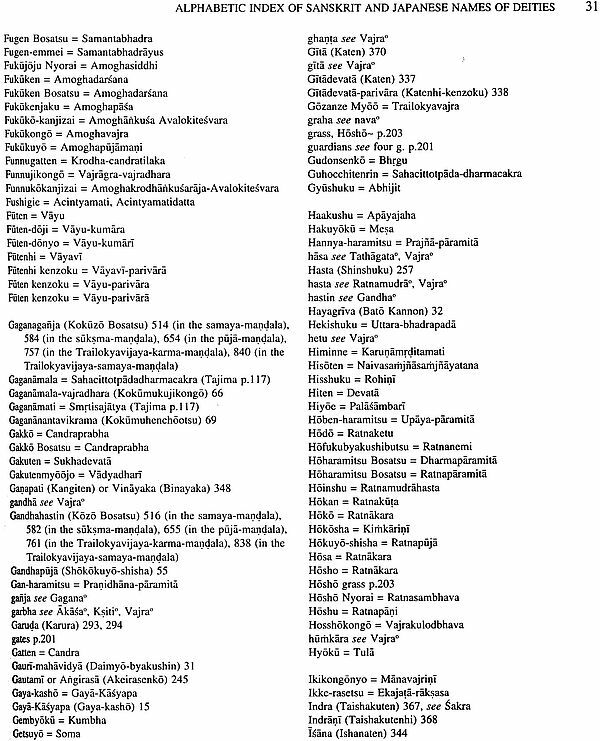 They consist of 19 volumes amounting to 11,100 pages. They were presented to the Emperor and the Empress by the late Abbot Gijin-jijo who visited the Imperial Household accompanied by Dr. Junjiro Takakusu, in the 13th year of Showa (1938). A Jiun Memorial Society was established at Tokyo in the 4th year of Showa (1930).